My Plate or Yours? : Watermelon – Sweet and Savory! It is the tail end of watermelon season here in Indiana and I am stockpiling memories of crisp sweetness to get me through til next July. I was never too much of a watermelon eater as a kid because, frankly, it seemed like way too much sticky mess for minimal reward – all that dripping of juice and spitting of seeds to get a fleeting mouthful of sugary, watery crunch. The discovery of melon ballers and then, oh joy – seedless melons – turned me back on to watermelon as an adult. But the best discovery of all was the revelation that watermelon is not just for dessert after a cookout, but actually goes great with savory flavors -- like goat cheese, salt, chilies, and vinegar. A whole new world of watermelon-loving opened before me. Blend goat cheese and herbs in processor or by hand. Add a small amount of olive oil to moisten and smooth the mixture. Set aside. Mix melon, olives, tomatoes, and greens together. Toss with salt and pepper and chopped tarragon to taste. Drizzle with olive oil, and toss gently. Add vinegar to taste, and toss again. 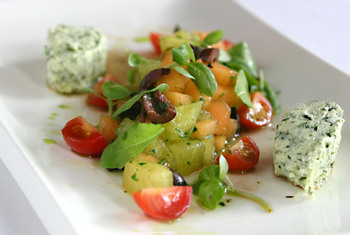 Plate as desired, individually or family style, with a heap of salad garnished with goat cheese quenelles (goat cheese shaped in ovals with two spoons) or scooped with a melon baller. If desired, drizzle with herb oil (1 cup of herbs pureed with canola or grapeseed oil (do not use olive oil for this as the heat generated by the blender will make it bitter.) Serve cold. The combination of watermelon and goat cheese is really magic. Yesterday for lunch I just had a few slices of perfect watermelon with some Capriole Farms Old Kentucky Tomme (one of my favorite cheeses this year, but I was pretty fond of it last year too, when I blogged about it here.) I don’t know why goat cheese and watermelon work so well, but the salty, tangy cheese and the crisp, sweet melon are a perfect combination. 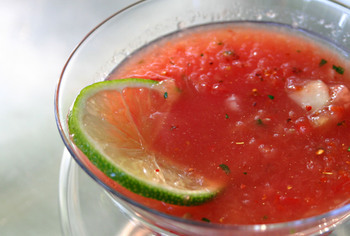 Another watermelon find was this recipe from Bloomington Cooking School owner Jan Bulla-Baker, for Watermelon Gazpacho. Puree 6 cups of watermelon with orange juice and oil in blender or food processor. Transfer to bowl and mix with remaining ingredients. Blend with hand blender to desired consistency. Season with salt and pepper to taste. Refrigerate. Serves 15-25. It’s wonderful stuff, but if even that seems like too much effort on a hot summer day, do what I did for lunch this afternoon. Slice up some watermelon, squeeze a juicy lime over it, and sprinkle it with a mixture of spicy chili powder and kosher salt. My mouth is still happy. Oh Oh OH! You are never going to believe this--I just shoved into the fridge the FRESH CHEVRE I made from the goats I've been milking ALL WEEK LONG for a friend of mine! Oooo... watermelon & chevre, here I come... btw, at Cafe Provencal in St. Louis we had a wonderful version of this salad that featured, I believe, a sweetened olive oil as dressing--total yum. Also, I finally did that sermon on food issues at my church last week to a great reception. It's posted on my blog if'n ya wanna see it, although it's quite inappropriate for a class, I think. I got quite a bit of interest in Slow Foods, though! May be a convivium in the offing here after all! Lovely photo of the salad, and of course I would love this because there's goat cheese and tarragon! What more do you need? I've got a watermelon in the frig just waiting for this gazpacho. I'm psyched. What cool recipes, as pretty as they are refreshing! Now I'm going to have to go out for watermelon - I have everything else! Lovely recipes, Christine, though I'm especially drawn to the salad; it must be as delicious as it is beautiful. I just posted a watermelon salad a couple of weeks ago with olives in it, and now I'll be trying yours with goat cheese.